Though he left government service early last year at the close of the Obama administration, former Secretary of State John F. Kerry, now 74, certainly doesn’t look — or sound — like a man ready to retire. Kerry spoke expansively Tuesday evening about where the world appears headed and about what he learned in five decades as a U.S. Navy officer, a political activist, a lieutenant governor, a U.S. senator, and the nation’s top diplomat, during a 90-minute talk before a rapt audience at Harvard Kennedy School (HKS). Kerry encouraged students to find their own pathways from belief to action, recalling returning home from combat in Vietnam — a conflict he came to believe was “a lie” — and leading a huge march on Washington, D.C., to demand better treatment and benefits for veterans who had endured the war’s horrors or were struggling with the aftereffects, physical and mental, of past conflicts. The experience prompted his long activism on veterans’ issues and, eventually, a run for elected office. Kerry took questions from Institute of Politics (IOP) Director Mark Gearan and fall resident fellows, including Amy Dacey, former CEO of the Democratic National Committee; Joe Heck, former Republican congressman from Nevada; Brittany Packnett, vice president of national community alliances and engagement for Teach for America and co-founder of Campaign Zero; and Margaret Talev, Bloomberg News reporter and past president of the White House Correspondents’ Association. Kerry remains engaged in world affairs and is in frequent contact with former counterparts and colleagues in Europe, Asia, and beyond — so much so that President Trump complained earlier this year when Kerry used his relationships in Iran to try to prevent the U.S. from withdrawing from his signature accord, the Iran nuclear deal. Kerry noted the stream of Trump’s disparagements of NATO and European leaders such as German Chancellor Angela Merkel and British Prime Minister Theresa May, as well as his affinity for Russian President Vladimir Putin and other authoritarian leaders, and the unilateral withdrawal from the Trans-Pacific Partnership, a trade pact that Kerry led toward agreement. Kerry said Trump’s views and actions have raised “very significant” concerns both for European allies at a time when Europe appears ready to fracture, and for Asian allies who see them as a repudiation of Obama’s foreign policy emphasis on the region, the so-called Obama Doctrine. “We worked very hard in the Obama administration to make sure we were doubling down on Asia and spending a long time building relationships. So, I think it’s very costly. We are paying a price, and we will pay a larger one if it continues,” Kerry said in the interview. That said, Kerry believes America’s allies have not lost faith in the U.S. and what it stands for, and predicted that if the Democrats can win the presidency in 2020, most of the frayed relationships will be restored within months. But as much as he disagrees with the Trump administration’s approach on a host of foreign policy and domestic issues, Kerry said the president is not the sole reason why the U.S. appears to have taken a U-turn in key areas. In his recent memoir, “Every Day Is Extra,” Kerry, who ran unsuccessfully for president in 2004, left the door open for another bid. He repeatedly sidestepped efforts to be pinned down on his plans for 2020. Kerry infamously was the target of the first effective fake-news-style political smear of the digital era. But he said his campaign’s flat-footed response to the “Swift Boat” attack on his decorated service in Vietnam was ultimately a misunderstanding of the forces at work. “People interpreted it incorrectly, and I take the blame in the end,” he said. Kerry said he’s open to embracing another candidate if one who understands the issues he cares about gets in the race. He cited former Vice President Joe Biden (“clearly qualified”) and businessman and former New York City Mayor Michael Bloomberg (“terrific on guns and climate change,” and “an adult”), neither of whom has indicated he’ll run. 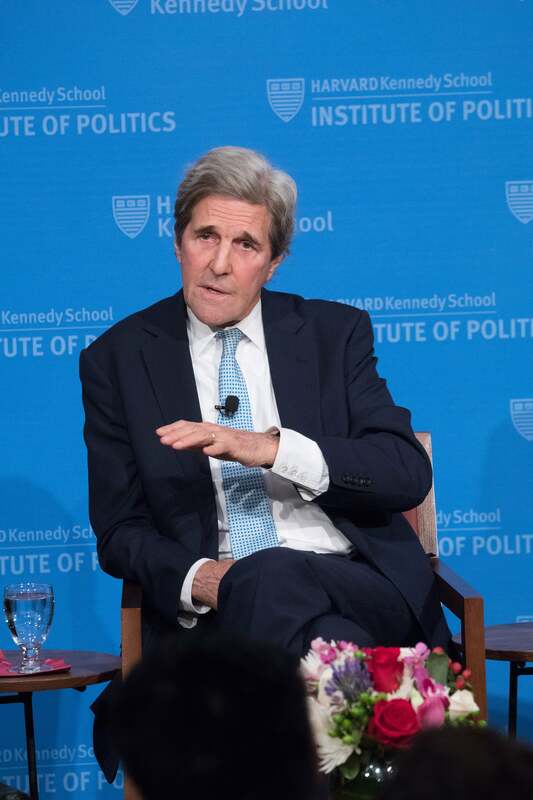 On climate change and the environment, another subject that drew him into politics in the 1970s, Kerry said he is incensed that the issue continues to be given short shrift in the U.S. and is used as a political football, as with the Paris Agreement, on which Kerry led negotiations. He said the science is indisputable and the crisis is urgent. “None of it’s out of reach. It’s just a total absence of political leadership. So, I am motivated to make sure we’re not going to flagrantly waste time in one of the greatest acts of political malpractice you could ever imagine,” he said. Though not defending its incursions into Crimea and Ukraine, Kerry said Russia’s current hostility toward the U.S. is partly due to “a series of mistakes” over the last few years, including U.S. “triumphalism” and the push for Russia to join the West, which he said caused resentment and made Putin feel threatened, thereby ratcheting up tensions unnecessarily. Kerry also criticized all-or-nothing extremists on immigration, saying that while asylum seekers must be allowed to enter this country and the millions of undocumented residents here should have a path to citizenship, the U.S. also has to maintain strong borders and uphold the law. “It’s going to take a compromise on both sides,” he said. The country could implement a kind of 21st-century Marshall Plan for countries in Central America, for example, to help stem the flow of migrants. He also cautioned students in the audience not to pat themselves on the back for voting in record numbers during the 2018 midterm elections. While laudable and vital to the Democratic Party’s success in the House, he said, the figure represented only 32 percent of eligible young voters. More young people need to turn out in 2020 and press their elected officials to act on the issues they most care about — whether immigration, climate change, or criminal justice reform — rather than use these matters as fundraising tools or excuses for legislative standstill. “You have to make meaningful issues voting issues. If you don’t make them voting issues, you don’t get the change you want,” said Kerry. “Writ large, our democracy right now is absolutely dysfunctional. It is a disgrace — and I say that of both parties.